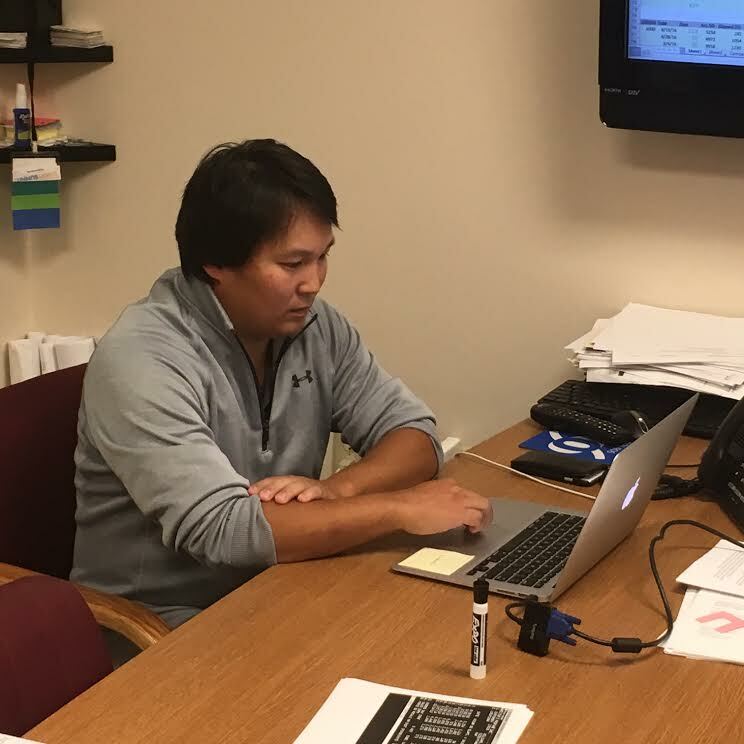 Lee Francisco is one of the high tech pioneers in Marquette. He founded 906 Technologies in 2005 and remains its CEO today. The company also led to the creation of 906 Engineering and, most recently, 414 Technologies. Brian Cabell sat down with Lee to get a better sense of his life and philosophy. BC: Where’d you grow up? LF: I grew up in Amasa, Michigan. That’s a population of about 400 people. My parents owned the Amasa Hotel and Bar there so we grew up in a business environment…a restaurant environment. My brother and I were definitely the minorities but we were well taken care of. It’s one of those really close knit communities. You get to know everybody there. Growing up, we had to bike four or five miles to go hang out with our friends. BC: Good memories of your childhood? LF: Yeah, a lot of great memories. Since there wasn’t much to do there besides helping out with the bar and restaurant, we would pretty much play sports every single day with our friends. We’d meet at the park and play football, baseball, basketball, everything. BC: Were you a studious kid? Nerdy? LF: I wasn’t really nerdy. I was kind of a jock because I was into all the sports. My grades were good. I didn’t really have to study too much. BC: You said you and your brother were minorities. What was that like? LF: Well, my brother and I were adopted when I was five and he was four, and when I started kindergarten, I didn’t speak any English, so I had to take kindergarten twice. LF: My brother and I were both from South Korea. He’s my biological brother and we were adopted in 1984. And three years ago, our birth mother reached out to us and we finally got to find out our true reason for adoption so we’re just now finding our entire family history. We were told that it was our dad who gave us up for adoption, and we were adopted by the Franciscos of Amasa, Michigan. BC: You had to be curious about your birth mother. LF: A lot of curiosity and a lot of emotions. We just met her for the first time in February. There’s no words to describe it. It was a life-changing event. (He pauses) It was nice to see her and we’re still trying to figure out the history behind our adoption…and it’s something I really don’t want to talk about right now…But knowing that we have her and we have other aunts and uncles and cousins in South Korea, that’s something we never thought would happen. BC: Let’s get to your parents here in the UP. If there was one message they’d tried to impress upon you when you were you were young, what would that be? BC: You went to NMU. Was that just the logical place to attend college? LF: Well, it was two things. One was to be close to my family and the other was to follow my girlfriend who is now my wife. We’ve been together since junior year in high school. BC: What do you suppose was the single most important class you took at NMU? LF: The greatest class that I had was with a professor who encouraged entrepreneurship. He encouraged us to come up with projects and build teams to see these projects come to fruition. Having a professor so hands-on, wanting to build stuff with the students…That struck me as something that all professors should do. BC: We’ve heard from some high-tech people who question the value of a traditional college education. How do you feel about it? LF: Well, as an employer, I think degrees are beneficial because you know that someone has gone through everything they needed to and they were willing to commit to something long term. But I’m not going to say that if you have a desire to do something, that it’s wrong to skip college. There’s been a lot of successful people who don’t have college degrees who’ve done really well. So as an employer, I look at two things. If they have a degree, great. If they don’t have a degree, do they have the experience? 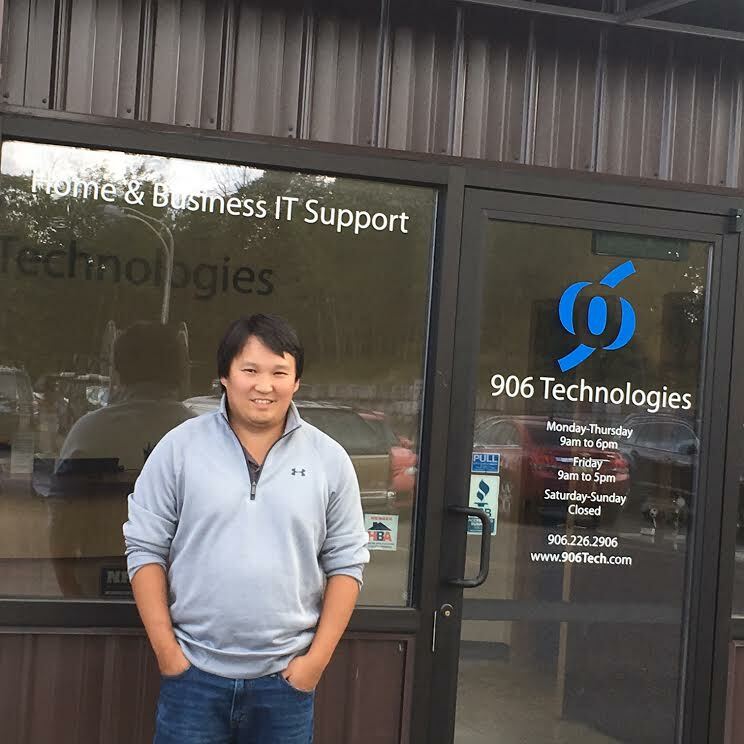 BC: When you started 906 Technologies, did you do it with trepidation, hope…or what? LF: I was pretty confident it was going to be successful. At the time (2005), I was working at Northern full-time. We had just bought a house, we were planning on starting a family, and to invest $20,000 into a start-up, it was a big commitment but I envisioned this new company as something I could rely on. And with my family history, I knew how to treat people, and also working at the university for five years gave me a lot of confidence. I felt comfortable going into new situations, working with all the departments and all the staff…and I felt comfortable that I could provide good customer service in my business. BC: You were something of a pioneer when you started your company here, weren’t you? LF: Well, there were computer companies but the software side (of 906 Technologies) was something that was just kind of luck because the two people that I hired who then became partners had experience with development and they came up to me and said, “Hey, you know, we can do websites.” And they did a website for St. Christopher’s which was our first website and it looked great, and that’s when we said, “All right, we can promote software development,” and so we started to build that. BC: What is the greatest misconception that folks like me–people outside of the high tech industry–have about high tech? LF: It’s not everybody, but some people think everything is going to work perfect and that projects or equipment are going to work without failing. It’s not like that. You just have to let people know that there are problems and that we’re going to be the company that will resolve them. But it’s hard when people are surprised when something’s not working the first time. They just don’t understand that sometimes it takes work to find the proper solution. BC: High tech seems to be a heavily male industry. Why? And how about your company? LF: You know, when we first started it was really…it was all males. But just as of the last four months, we have had the most females ever. We have four women here out of 31 people. LF: I’m not sure. We interview people and hire them based on experience. I don’t know if women aren’t sending in resumes as much as males are. We just don’t see many female developers who apply, we don’t see many female techs who apply. I’m not sure why. I know they’re capable. BC: Do you think Marquette’s Smartzone is going to succeed? LF: I think it has everything needed to succeed but we need to have entrepreneurs come out with ideas and know that there’s a service like the Smartzone out there. I think that’s the hardest part. What’s weird is that people come into our offices knowing what we do, and they say, “Hey, I have an idea. Can you help me build it?” The first thing we do is ask them whether they have a business plan, whether they have everything set up and whether they have proper funding. And if they don’t, we refer them to the Smartzone. So I think with more advertising and more encouragement from the community, I think the Smartzone can be successful. It’s just that we need more entrepreneurs to come out with their ideas and their plans. BC: You’re living in a northern outpost, away from the cities. Do you sometimes wish that you were living and working in Silicon Valley? LF: Well, one, I think there are going to be more opportunities here for investments and networking capabilities, but…you can’t give up the quality of life you have here. I’ve known people in Silicon Valley, I’ve been to San Francisco, and just living in a high-traffic, overpopulated, way-too-expensive city…that’s not me. And my wife would not allow it anyway (laughs). BC: Tell me what the world’s going to be like in 20 years. What can we expect in the way of technology? LF: Twenty years? Well, obviously, the autonomous vehicles where you’re not going to have to drive anymore. The vehicles will drive for you. Maybe, better connectivity, better communication…we probably won’t even have smartphones by then. Everything is going to be VR (virtual reality) or augmented reality. Any information that you want, you won’t have to type or push a button or do anything. Everything is going to be voice-activated. BC: So if I’m not carrying a smartphone, what do I have? LF: Maybe glasses or a projection, or maybe a watch. You won’t need a phone but somehow you’ll see a screen. BC: Do you write letters? LF: I can’t remember the last one I wrote, to be honest. Oh, you know what? It was thank you letters for my wedding. BC: And that was how long ago? BC: Is there something we’re losing by using emails instead of writing letters? LF: Yeah, I think so. We’re losing spelling. (BC laughs) Because I would consider myself a great speller and when I wrote stuff, I had to force myself to get it right. But now, you see the red line, and auto-correct does it for you. Before, you would have to proof read your work, and you would say that’s not right and you’d have to correct it yourself. BC: But what about the thought and intimacy and time that goes into writing a letter or a card? You don’t see any value in that, as opposed to just sending an email? Or is that just an old person’s view of things? LF: Actually, I think it’s me. One of the things I suffer from is hyperhidrosis. My hands are always sweating. And I always hated when I was writing an essay in high school because when I would let my hand rest while I was writing, the paper would get wet. I never liked that experience so that’s why I don’t write now. BC: You have three children. What message are you trying to convey to them? LF: Listen and be respectful. They’re doing great. They’re being raised by a teacher so they’re doing well in school, but if they do mess up, we just sit down with them and tell them what they did wrong and how they need to act. BC: Are you a good husband? BC: What makes a good husband? LF: Loyalty. Doing anything that is required of the family. BC: Is there something that you haven’t achieved in your life so far that’s really important to you? LF: Well, I want to be set in life with my retirement because I know that I can make a bigger impact…I would really like to be a philanthropist because I know what I could do. Instead of just giving people money, I think I could build other companies that would have a social impact. That’s important to me. After the interview, Lee disclosed that he and his family are going to Korea next spring so that they can all meet the family that he and his brother left behind more than 30 years ago.